A love against all odds . . .
A battle against ancient forces . . . Wary companions, they are sent—in human form—back to a time when magic went terribly astray. Together they must right the wrongs caused by this devastating power—if only they can find a way to trust each other. But even as their attraction grows, an old evil resurfaces, and they risk losing each other and destroying magic forever. Review: My word. I was a little iffy toward the first book in this series, but not so with this one. Mette really hit her stride here. This book was gripping, heartwarming, and just... magical. It had a very strange plot (I wasn't really sure what the main goal of the story was) but that didn't matter. What mattered was the amazing way that the characters interacted and saw their world. And the love story was so wonderful. Just wonderful. Something I found was interesting was that when we were given a snapshot of what had happened to the main characters of the first book, I discovered that I cared a lot more about them than I thought I did after I finished The Princess and the Hound. I guess absence makes the heart grow fonder? Dunno. But nothing compares to the two main characters in this one. Woah. Have I mentioned how much I loved the characters in this book? After I finished it I went back and reread the last couple chapters, 'cause I wasn't quite ready to leave these characters. I'm still not. I wish I could go back and read it again for the first time. So... they travelled back in time, right? But doesn't that mean they changed the course of history? Do George and Marit even exist anymore? If they don't, what was the point of the first book?! That whole idea was really confusing. But other than that, beautiful book. I'm so glad I own a copy. This review is part of Utah Author Month. P.S. I feel like this is not a good review. I'm having a hard time putting my thoughts about this book into words. Hopefully you all got the bottom line of: I liked it. :D This is my favorite of the three in the series! I had a wonderful visit in this world of magic! It was comfortably familiar as the place where Prince George came into his own. 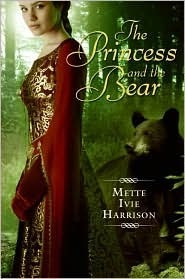 In this sequel to THE PRINCESS AND THE HOUND, we see a relationship develop between the bear and the hound who were part of George's story. This new story is enriched by the first one, but not dependent upon it.